This report covers the global robotic surgery system market performance in terms of revenue contribution from various segments. The global robotic surgery system report begins with an overview of robotic surgery systems and key definitions. Market viewpoints section underlines macro-economic factors influencing growth of the global robotic surgery system market along with a detailing of the opportunity analysis of the market. This is then followed by key market drivers, restraints and trends. The global robotic surgery system market is segmented based on component, application, end user and region. PMR utilizes a triangulation methodology that is primarily based on experimental techniques such as patient-level data, number of procedures and capital equipment install base to obtain precise market estimations and insights on various medical devices and medical technology. Bottom-up approach is always used to obtain insightful data for the specific country/regions. The country specific data is again analysed to derive data at a global level. This methodology ensures high quality and accuracy of information. The robotic surgery system market in North America is a clear evidence of the region’s inclination towards advanced technologies. This regional market is the highest contributor to the growth of the global robotic surgery systems market. 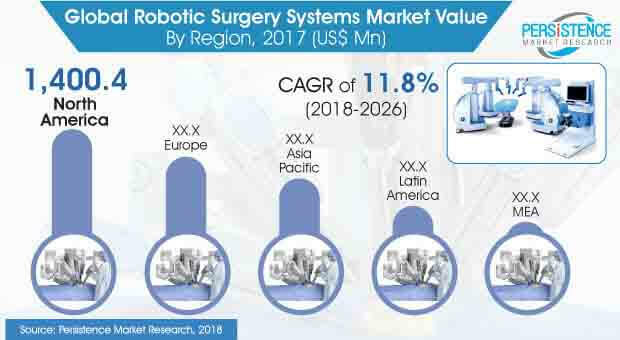 According to the projections of Persistence Market Research, the North America robotic surgery systems market is expected to reach a market value of US$ 4,000 Mn by the end of 2026, with an exponential CAGR of 12.9% during the forecast period. Before robotic surgery systems were introduced, most of the prostatectomies (about 95%) were performed with an open incision. Minimally invasive surgery wasn’t an option for men needing a prostatectomy even though laparoscopy was available and in use for other types of surgeries. In contrast, presently, more than 85% of the prostatectomies performed in the U.S. are done through robotically assisted minimally invasive surgeries. This shift has also been a part of patients’ move towards a cost-effective treatment option. Government and regulatory bodies of various countries are adopting various cost containment measures to reduce the healthcare burden, especially in developed economies. The Europe robotic surgery systems market is aided by a favorable reimbursement scenario in the region. There are several third party providers available to provide reimbursements for the medical procedures of the public. Also, a large number of the hospitals are publicly funded, which has made reimbursement procedures simpler for the people. As the adoption of robotic surgery continues to rise steadily, it has turned to be better and more cost efficient than alternative surgeries. Among various regions of Europe, Germany dominated the robotic surgery system market and is expected to be the most lucrative market in the region with a market attractiveness index of 1.9. Obtaining regulatory approvals is not an easy task. When companies modify existing products or develop new products, they must receive permission from the regulatory bodies of the respective countries. Along with regulatory approvals, robotic surgery systems require additional testing, certification, modification and amendments of their already existing market approvals. When a product is exported to another country, companies may be required to modify their pre-installed systems at various facilities to comply with the revised regulations. This complicates the process of exporting the products, further hindering the demand for robotic surgery systems in foreign countries. There is also a lot of negative publicity surrounding the use of robotic systems in surgeries. Efficacy and patient safety associated with robotic surgeries has been questioned a number of times in statements by public officials and their concerns may hinder the global acceptance of robotic surgical systems. This may, in effect result in decreased product demand and a decline in sales revenue. In addition, it could also lead to an increase in the number of product liability claims, irrespective of whether they are relevant.